greater yam See tropical yam. 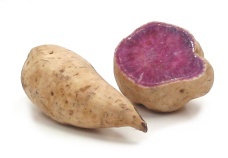 Japanese yam = satsuma imo = kotobuki = Japanese sweet potato Notes: Don't confuse this with yamaimo. sweet potato Notes: In American supermarkets, sweet potatoes are displayed next to something called "yams," which are moister than sweet potatoes and have darker skins. But according to the rest of the world (and botanists), we have it all wrong. To them, our "yams" are just a variety of sweet potatoes. 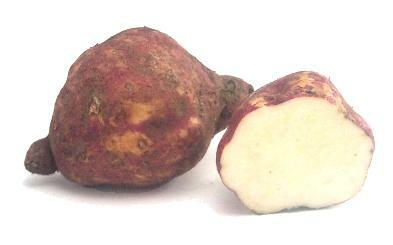 They use the word yam to describe a completely different vegetable, something we call a tropical yam. Sweet potatoes are quite versatile, but they're most often baked, candied, or made into pies. It's best not to boil them, as they'll lose much of their flavor. 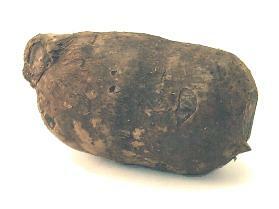 true yam See tropical yam. 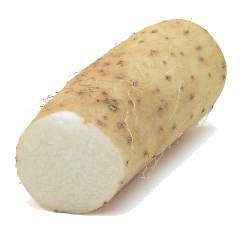 yamaimo = Japanese mountain yam Notes: This is a sticky yam that the Japanese peel and grate or julienne for salads. It's also fried or used to make soba noodles.